This post contains affiliate links which means if you make a purchase I receive a very small commission but don’t worry it doesn’t impact the price you pay at all. 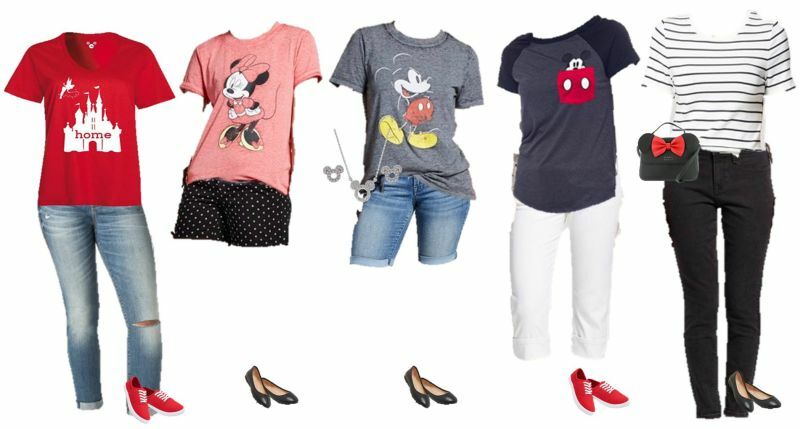 As a mom of a girl, I know how much fun it is to dress up your little girl while she still lets you have some input. They grow up too fast. 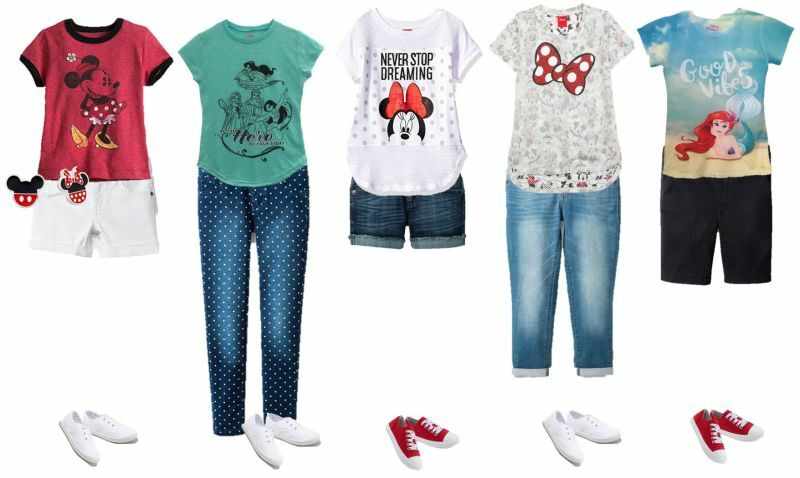 These five fabulous Disney themed tees combined with a few other pieces like jeans and shorts make the cutest Disney themed outfits, she’s bound to love. 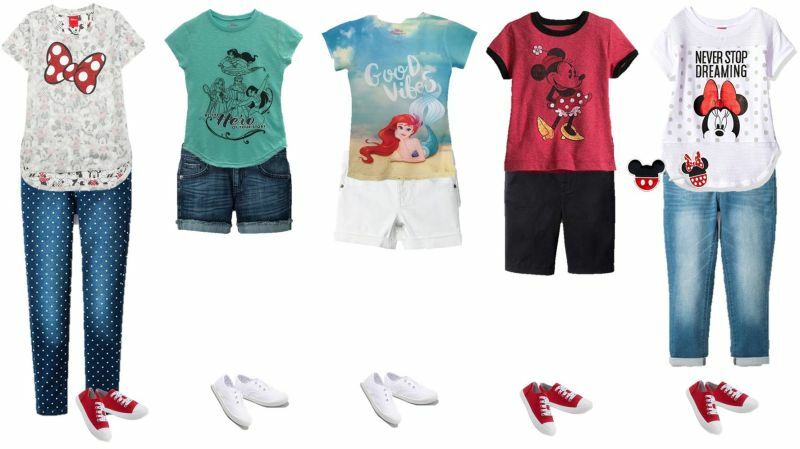 Mix and match clothing options make dressing your little one so much more convenient for you and makes it easy for her to have her input as well. Mix and match outfits also come in super handy when it’s time to travel. More options, less packing. You gotta love that. Pop in a couple pairs of shoes because you know a girl has to have options and one pair is just never enough. And you’re or she’s all set! Oh my goodness, a girl can’t forget her accessories! These adorable Disney Sterling Silver Mickey and Minnie Earrings fit the bill perfectly. 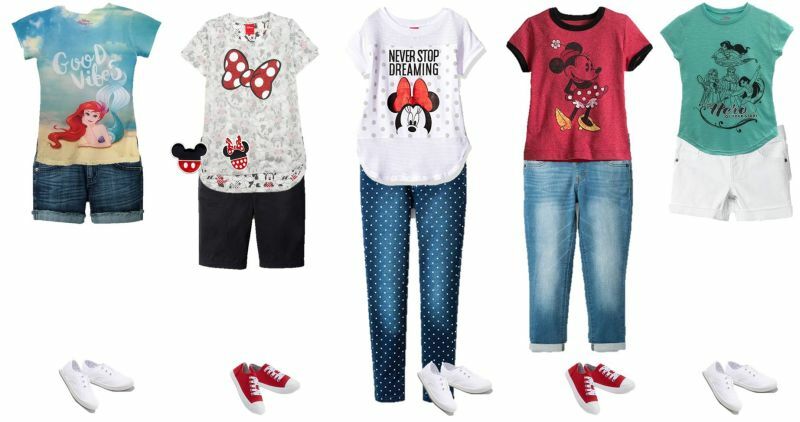 I won’t keep you any longer now that you have all these wonderful mix and match Disney themed outfits your little girl will look fabulous in. Go ahead get shopping! I love being able to mix and match outfits! Not only does it save me closet space, it saves me suitcase space when traveling. Plus no one wants to lug around a bunch of suitcases and bags through crowded airports with little ones. 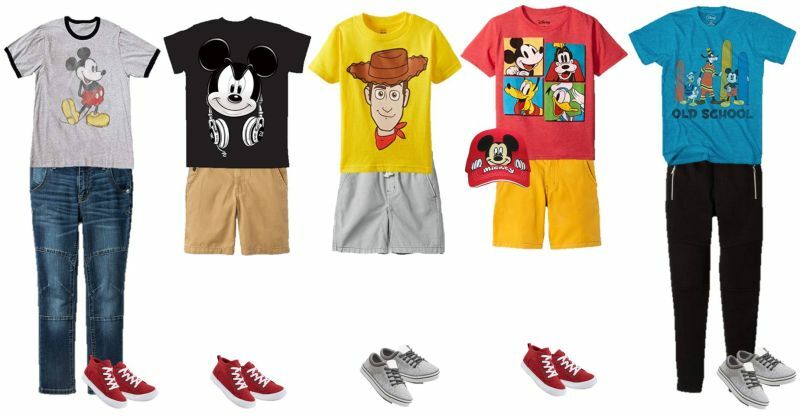 Mixing and matching is totally the way to go not only for mom’s and dad’s but for the kids too. The more outfits kids can make with the least amount of clothing pieces works for me. 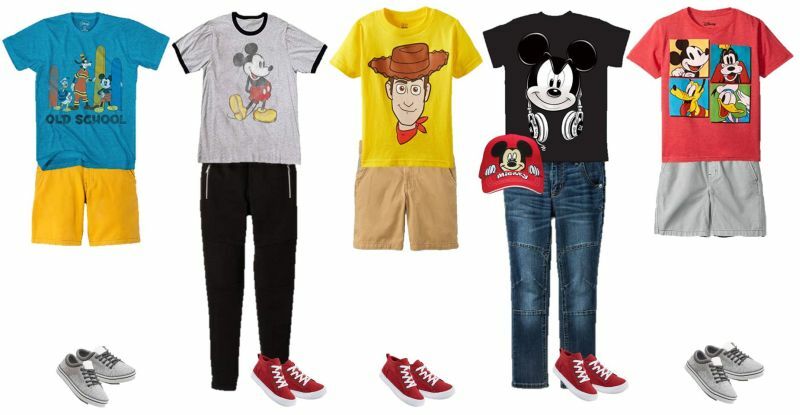 With just these 5 shirts, 1 pair of jeans, 1 pair of jogger pants, 3 pairs of shorts, 2 sets of shoes and a cap you can make a minimum of FIFTEEN outfits! And that’s just the minimum, there are plenty of more combinations you can put together. 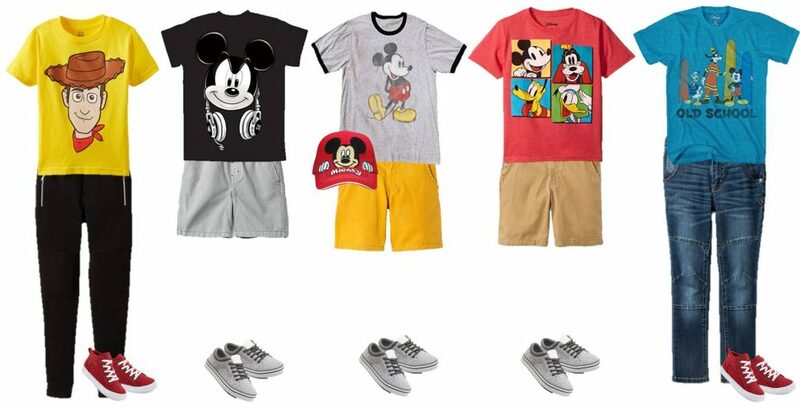 Ready to get your little guy Disney-fied from head to toe? 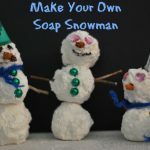 You’ve got plenty of ideas to work with now, so get to shopping and have some Disney themed fun! I don’t know about you but I love being happy and nothing makes me happy like Disney. 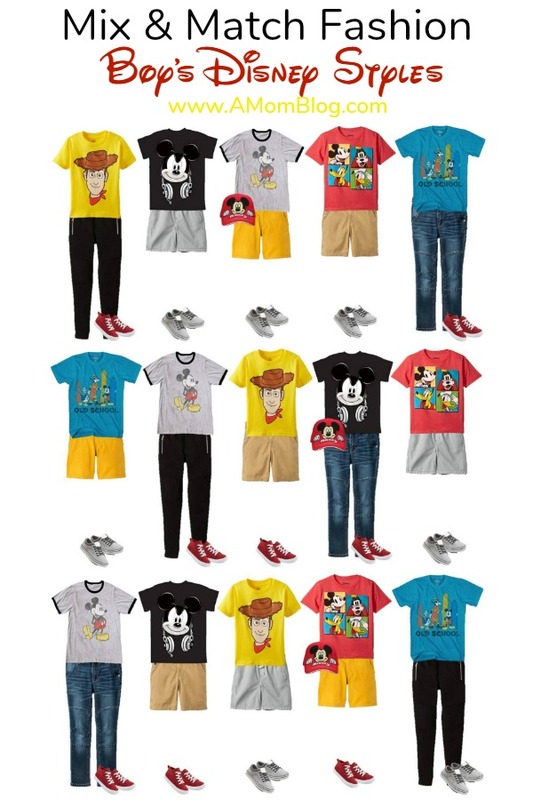 So popping on a Disney themed outfit really makes my day start and end with a smile. We all want to shop smart and make the most of our wardrobe right? 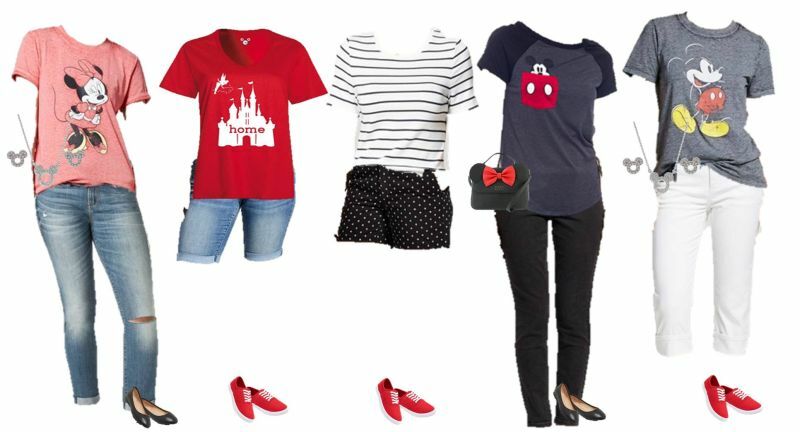 So what could be better than a few pieces you can mix and match that give you that Disney smile day after day, outfit after outfit? 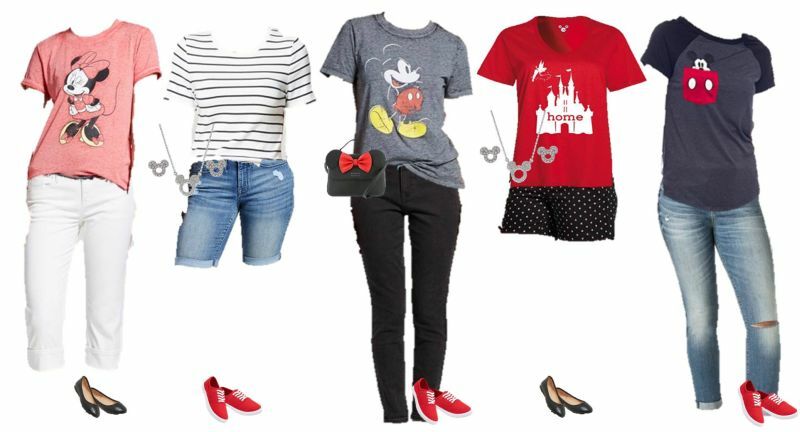 With these fourteen pieces (which include shoes, accessories and a handbag) you can make at the very least fifteen different Disney themed outfits – FIFTEEN! And the best part? Well, Disney is the best part but you love shopping at Amazon and Target don’t you? Who doesn’t? All of these pieces are from either Amazon or Target. You don’t have to go all over the place trying to find them. How many other outfit combinations can you come up with? 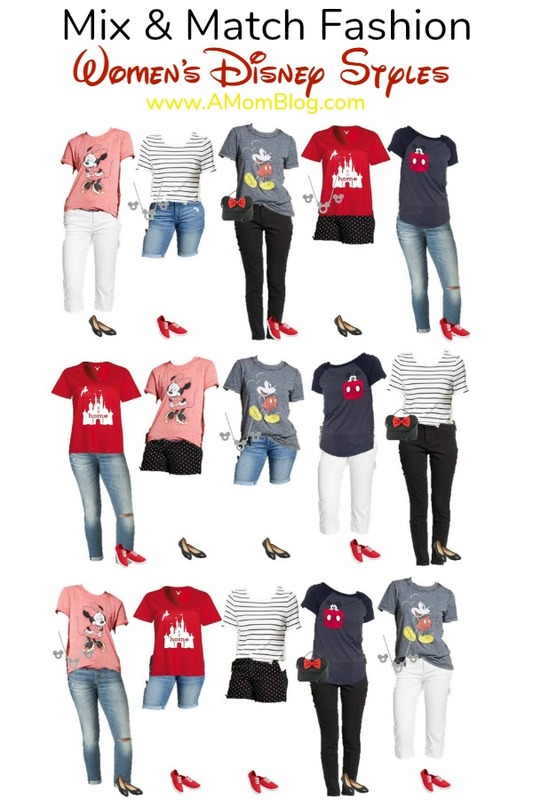 And don’t think this is just for the ladies, I’ll be sharing Disney themed fashions all week for every member of the family. So get your EARS on and let’s get shopping. It’s going to be an INCREDIBLE Summer at Disney! 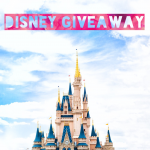 But even if you don’t have a trip planned just yet, it doesn’t mean you can’t go all out Disney!